Treatment of the diseased claw after veterinary medical indication. Subsequently cleaning of the healthy claw. The claw ought to be free of dirt and dust so that the resin connects well with it. 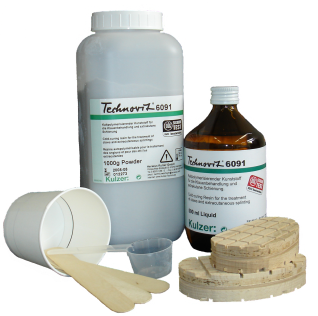 Put liquid Technovit® 6091 and accelerator in cup, add powder and mix to a homogenous bulk. Apply material with a wooden spatula in a thick layer to claw bottom and wooden log. Subsequently glue on wooden log directly to the claw. After firmly pressing on the wooden log to the claw bottom, model the overflowing material over horn and side surface of the wooden log. When the resin is fully cured, the claw is completely stressable. After ending the healing process, the wooden log can be removed mechanically with a suitable tool. Do not put any glue in the area of the ball, otherwise dents will form in that algesic region. If you shape or model the resin with bare hands wet your hands first with water in order to keep the cold polymerisate from sticking to your fingers. Special attention must be paid to the cleft of the claw. Any sharp edge or peak of the cured resin may easily lead to injury. The log of wood can be used double-sided, therefore it is important to spread the resin on the proper side. Shape the resin around the log and roughened claw septum, comparable to a slipper and let it harden. To accelerate the polymerisation, use our Technovit 6091 accelerator - Do not use a hair-dryer! The usage of a hair-dryer leads to a higher polymerisation temperature. Results: damage of tissue and pain!